In this guide, you will learn about ticks and the affordable pest control options to eliminate the pests. Ticks are relatively small in size and belong to the classification, Arachnida. According to studies, it has been estimated that these pests have been in existence for approximately 90 million years. Ticks require meals composed of blood in order to complete the cycles of their life, which are considered to be highly complex. There are well over 800 different species of ticks around the world; however, only two are known to result in illness or disease in people. Ticks are known to vary in color, according to their species. Adult ticks have the potential to be smaller than 1 cm; however, if they are engorged as a result of a feeding, they may be over 1 cm long. Tick larvae are typically smaller than 1 mm. The most troublesome of all tick species are the Deer tick, the Lone Star tick, and the American Dog tick. These pests are typically located near areas that are heavily wooded and/or have a high level of vegetation. The creatures require moisture to live and their food sources typically include the blood of reptiles, mammals, and birds. While each species has its own food source preference, most ticks will choose to feed on whatever is readily available to them. 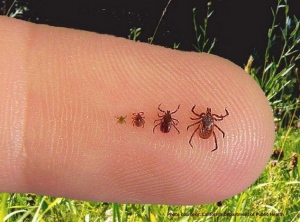 Most ticks are considered to be transmitters of illnesses and diseases for animals and people. These creatures have the unique ability to transmit illnesses to a large number of hosts. Additionally, ticks have the ability to cause economic problems. One example of such harm includes the transmission of the condition known as “Texas Fever”, which has the ability to kill approximately 90% of all yearling cows. The complication that results in the transmission of diseases and illnesses stem from microbes contained within the saliva of the tick. When this is secreted into the skin and/or blood of a host, problems develop quickly. There are several affordable pest control prevention and control options for those that are worried about tick infestations, or, have personally observed a tick infestation. The first measure is to ensure that all holes, cracks, gaps, and crevices in the home are repaired and properly sealed. Next, it is important to keep grass cut and weeds eliminated. You may use pesticide treatments around the home in order to prevent infestations. If you have pets, it is important to ensure that they are cleaned and treated for fleas and ticks in order to prevent the pests from feeding on them.